Created and produced by HT Films, “Inner City Champions” is an electrifying roller coaster through Polee’s and Williams’ lives. The film takes the viewer to both expected and unexpected places and brings out a multitude of emotions as these two men tell their raw stories about their unforgettable high school careers, NBA careers, successes, failures, family, and redemption. The film won “Best Feature Film” this year at The Los Angeles International Underground Film Festival. The support for the film was incredible. It was the only sold out showing at the film festival. Amongst the excited audience was Freeman Williams himself and Jim Harrick, legendary college basketball coach. I walked away asking myself, “How many of our inner-city kids know that NCAA’s living all-time Division 1 leading scorer and the greatest player ever to play high school basketball are both alumni of Manual Arts High School? More importantly, do they know that these two living legends have come back to Manual Arts High School to build our young boys into men through the game of basketball? Every kid, every parent, every coach, and every Angelino needs to watch this film. 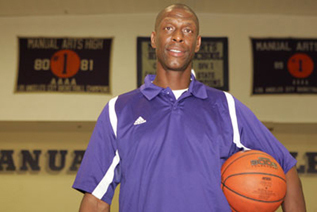 This is an LA Hoop Dream story that will resonate with you on so many different levels. It is a film that will undoubtedly deliver hope to its viewers and inspire every child that possesses a hoop dream. Not only has The Los Angeles International Underground Film Festival taken notice of this inspiring documentary, but also the Pan African Film Festival and the San Diego Black Film Festival have recognized this great story. If you would like to experience “Inner City Champions” it will be showing at the San Diego Black Film Festival January 30 – February 2, 2014 and the Pan African Film Festival Feb 6 – 17, 2014.